The holidays are coming! Before the hustle and the bustle of gift giving and party hopping begin, pencil us in for some time to destress at Azura. Enjoy an Azura Signature Facial and a One-Hour Massage for just $150 when booked together – regularly $190! Our aestheticians Hope and Jordyn and our massage therapists Michelle, Allyson, and Varshay can’t wait to see you this month! 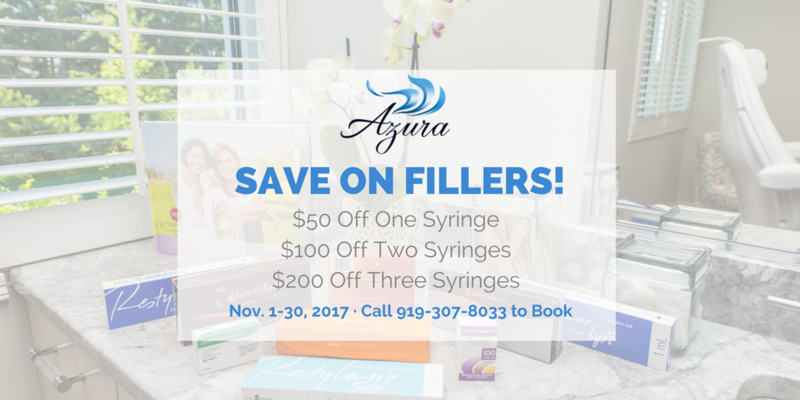 Until November 30, all fillers are $50 off one syringe, $100 off two syringes, and $200 off three syringes! Curious when fillers are the right choice for your skin? Check out Jennie’s blog! Now is a great time to stock up on your ZO professional skincare essentials with great gifts like this to take home with you – or gift to others! With your $150.00 purchase of ZO products, you’ll receive this nice black pouch that includes Balatone 2 oz. and Ossential C-Bright 10% Vitamin C Serum inside! Hurry in, this special offer is only valid while supplies last. 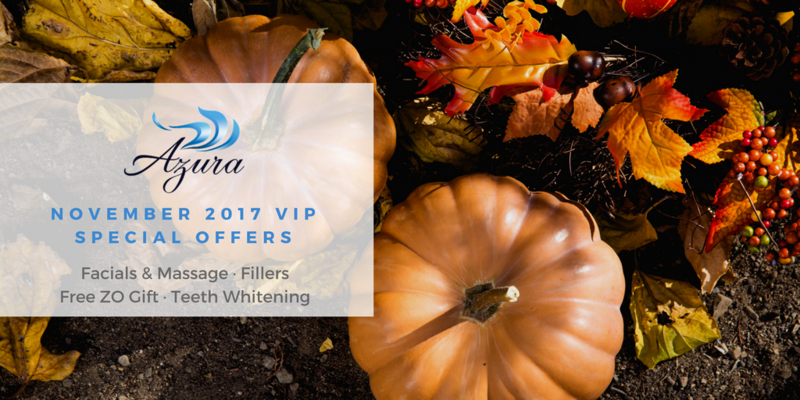 Through Wednesday, November 22, 2017, schedule your teeth-whitening treatment for just $79 and receive a free light, a $25 value. 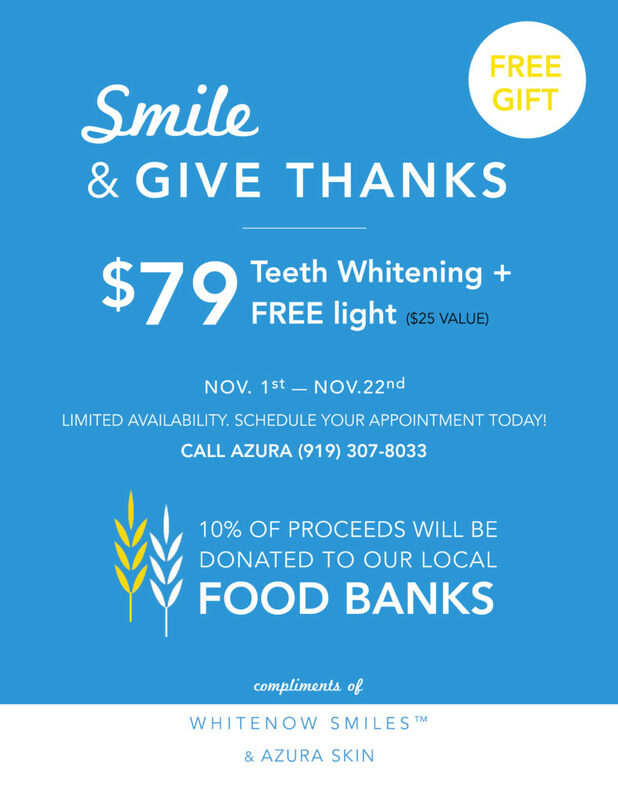 Leave with a smile knowing that 10% of proceeds from treatments November 1-22 will be donated to our local food banks! Appointments are limited, call 919-307-8033 to reserve your space. Don’t forget that all skincare products are 10% off when you donate a minimum of three non-perishable food items at Azura – all through December! We’re donating them to the Western Wake Crisis Ministry which helps our neighbors in need. 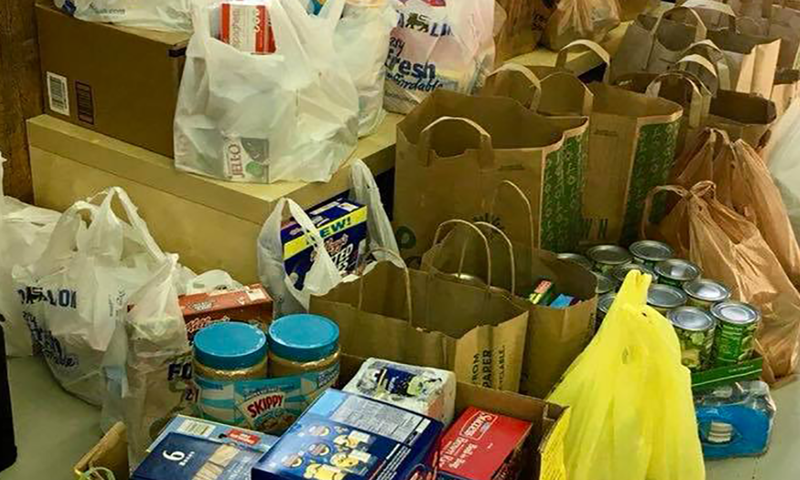 Check out the 650+ pounds that were donated in October after the Models for Charity BBQ event thanks to great supporters like you! We’d love to host an employee appreciation event for you here at Azura, but if you don’t think the schedule will work out, how about a special discount on purchasing massage services and skin care treatments for your team, instead?! Contact us today at 919-307-8033 or email us at Hello@AzuraSkin.com to get started putting together a beautiful way to thank your employees for their hard work. 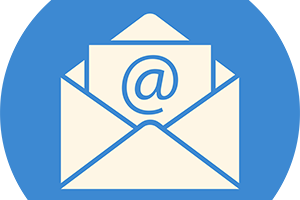 You can also contact us via our online form to get the conversation started! 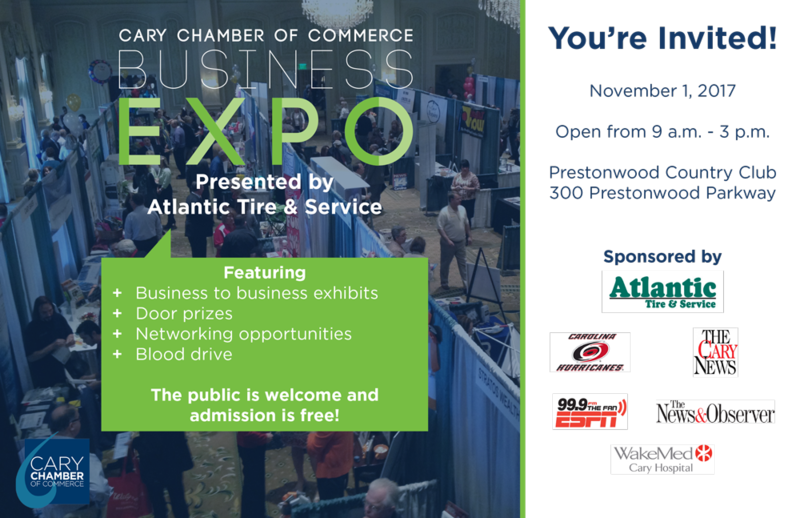 Visit Us at the Cary Chamber Expo! We’d love to visit with you at Prestonwood on Wednesday, November 1st! If you’ll be visiting the Cary Chamber of Commerce Expo, be sure to stop by the Azura Skin Care Center table and register to win some great prizes. Attendees for this event are free and do not need to register.